7:58 AM. Massive ice cloud advances on Catalina from the Tropics. 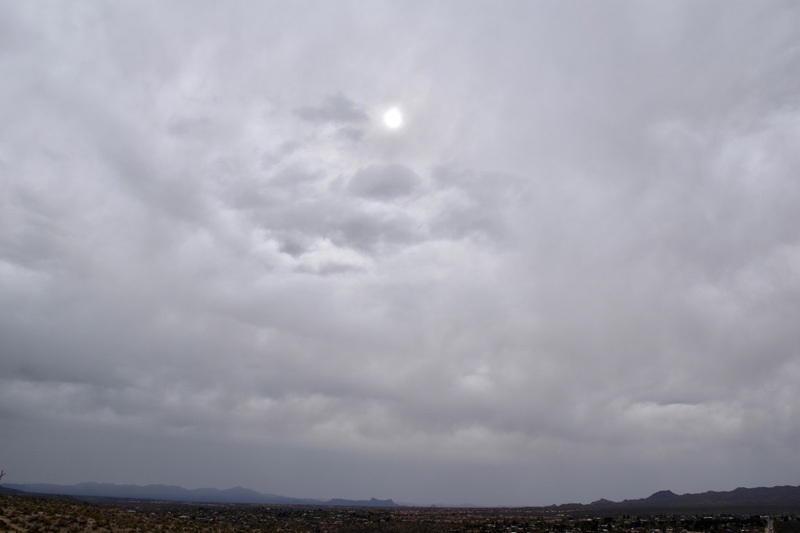 This Altostratus invasion covered the sky within about 15 minutes, and that was it for sun, except some “filtered sun” at times (when this layer is called Altostratus translucidus (the sun’s position can be seen). Its an all ice or mostly ice cloud. 10:58 AM. 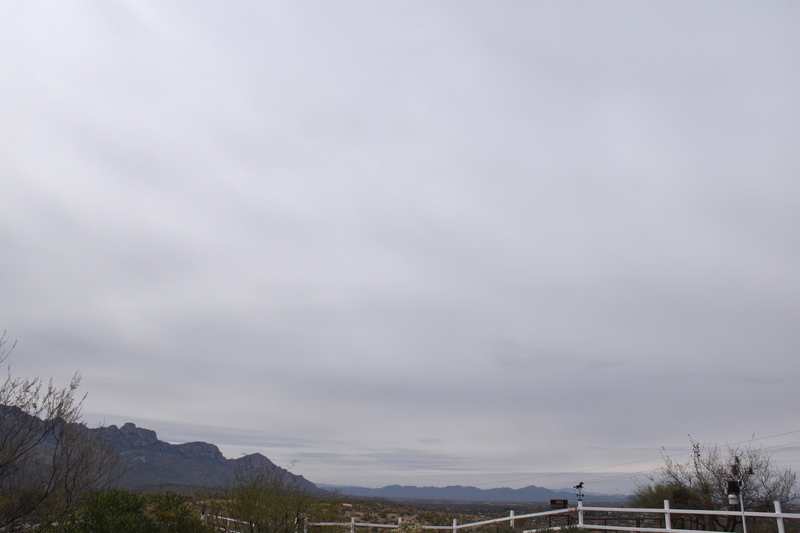 Altostratus creates a pleasant gray sky. 1:26 PM. Lower droplet clouds began to appear, high-based Stratocumulus. 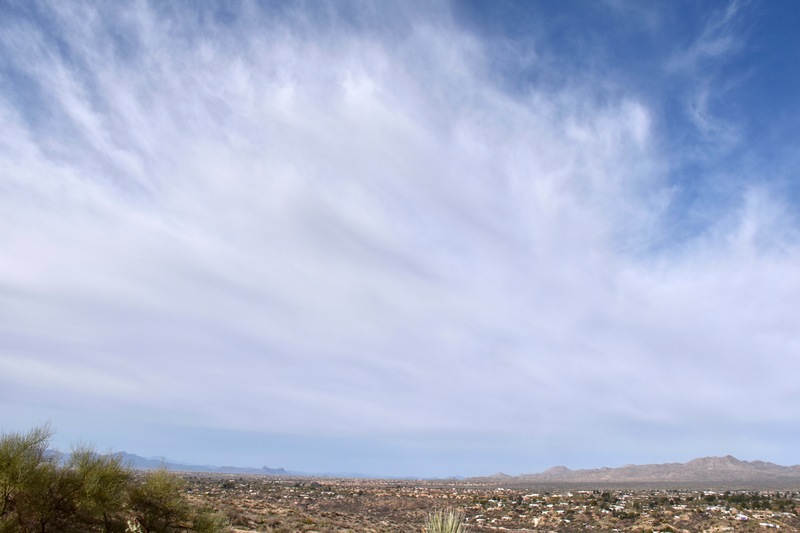 The globules are too large to be Altocumulus, though these were based at about 7,000 feet above Catalina, or a little above the height of Ms. Lemmon. 1:26 PM. A UFO appears to be soaring toward Catalina with some kind with a trailing spider web. Other lenticular can be seen, this one was truly out of this world. But, from where? What world? 1:41 PM. More lenticulars; more shades of gray. 3:36 PM. Altostratus is now transitioning to Nimbostratus with lower bases as steady, but very light rain, moves in toward Twin Peaks. 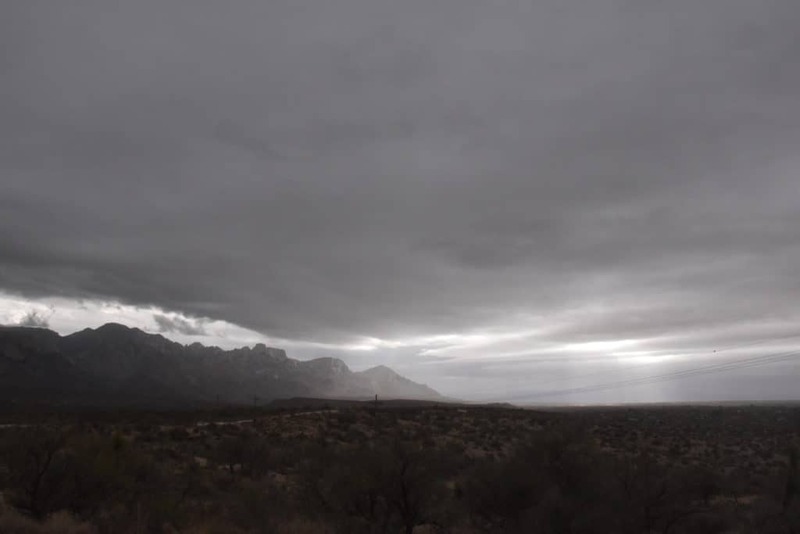 What you’re looking at here is mostly virga, and, as the relative humidity increases below virga bases, the virga is able to drop to lower elevations. The humidity is increasing due to gradually rising air that is accompanying an upper level trough. Got pretty wind about this time, too, before calming down. Not sure what that was from except maybe virga falling into very dry air ahead of the rain. 3:42 PM. Classic look of Altostratus translucidus. “Opacus” (too thick to see the sun), just ahead. Those darkest areas near the sun are droplet clouds. Most of the scene is ice cloud. 4:16 PM. 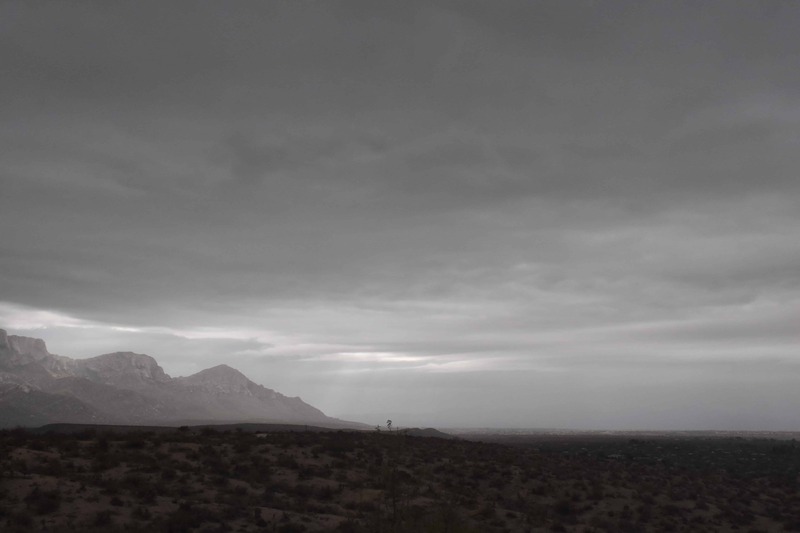 Finally, as very light rain began to fall, we now see the most perfect view of Nimbostratus you’ll ever see. I hope you took plenty of shots of this scene cloud maven juniors! 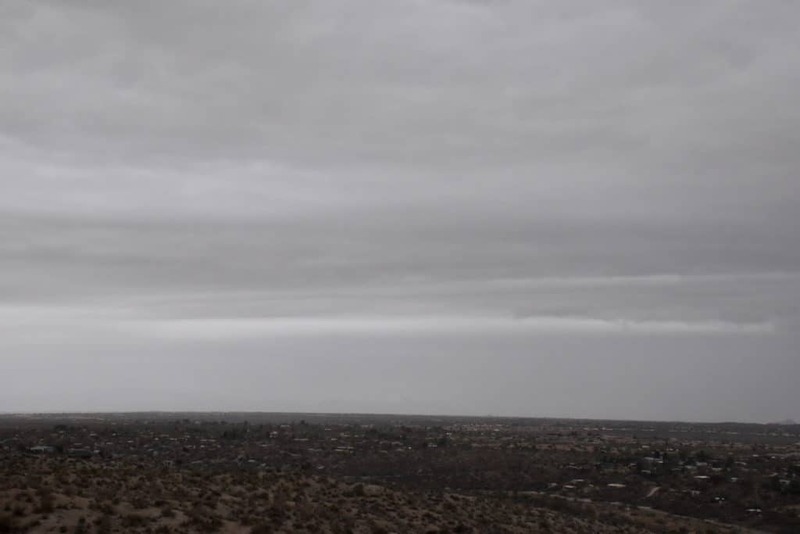 (Nimbostratus, the deep, deep cloud producing steady rain and snow is almost ALWAYS partly or totally obscured by lower Stratocumulus clouds so you can’t really see it. But, not here! Pretty much a sure-thing rain (we, unprofessionally forecast at least a 90-100% chance of measurable rain then) will move in late on the 16th or on the 17th. 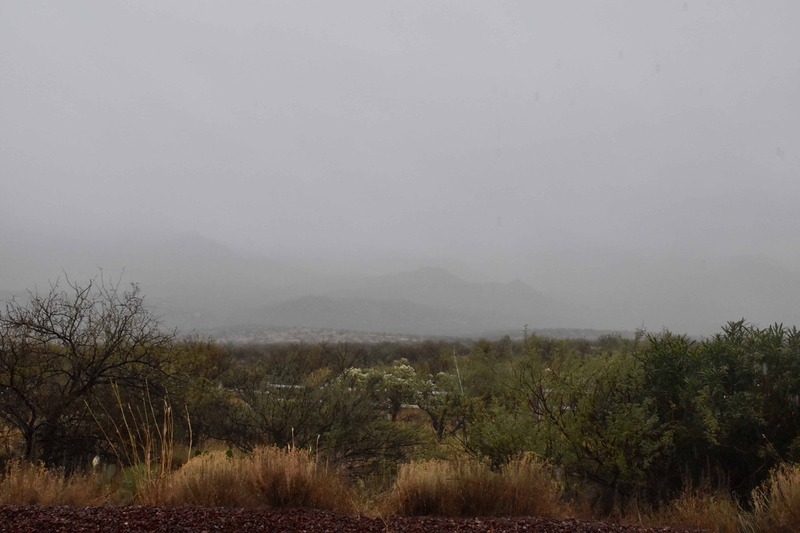 Should be a significant, vegetation-boosting rain, too–by that I mean at least a quarter of an inch–unlike this rain this morning. It looks,. too, like a second rain might move in a day or two after that one. Quite strong support in the ensembles (“spaghetti plots”) for that to happen, too. How great would that be? Very great, of course. After that, the models are showing even more troughs affecting AZ, but the ensembles aren’t sure about it. Neither am I (CMP). 6:25 AM. Altocumulus perlucidus. According to my cloud chart, informally known as “America’s Cloud Chart”, it could rain within 6 to 196 hours. Its quite useful. 10:24 AM. Altocumulus opacus. Note the rumpled look of the sky. 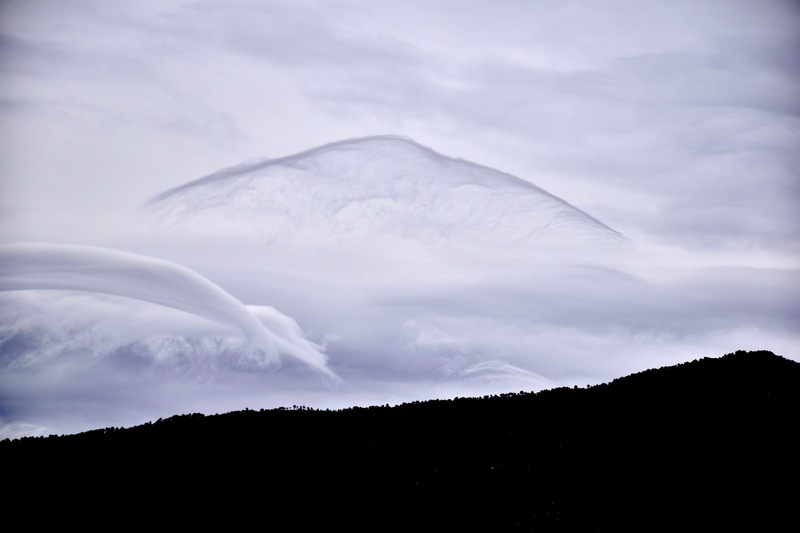 Indicates that the clouds are rather shallow and composed of droplets rather than a mix of ice crystals and droplets. However, if you strain your eyeballs and look to the horizon, you can see a smoothing and a little virga showing that the cloud tops are rising and they’ve gotten cold enough to produce ice. According to my cloud chart, when you see “Ac opacus” it could rain within 6 to 196 hours. 1:44 PM. 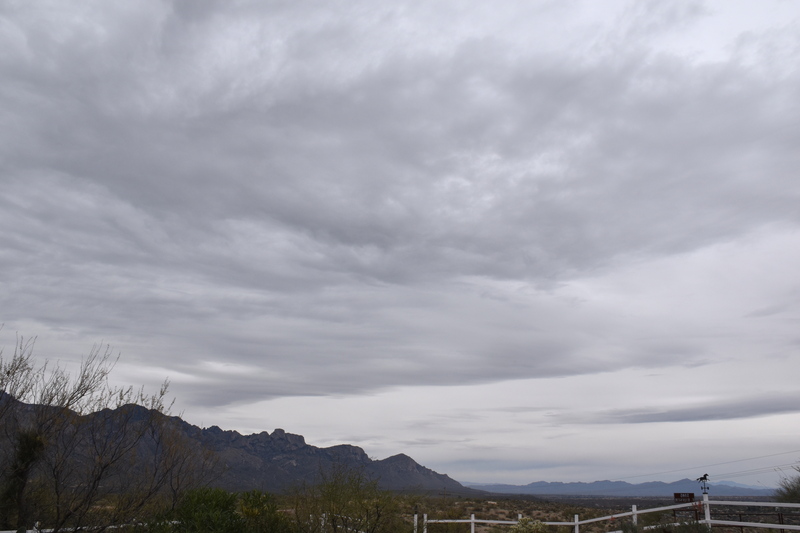 While the clouds are pretty much the same gray color as in the prior photo, they’re much thicker here and are “Altostratus opacus”. “opacus” because the sun’s position is not visible, though it wouldn’t be in this direction anyway, but to the right. The bottom of this is smooth due to widespread, light falling snow, though it not in a localized area enough to be called virga in this shot. The lack of bunched or heavy virga somewhere tells you that the cloud tops are pretty smooth, too, not a lot of variation in height. The base is really determined by the point that you descend out of this precip, in this case up around 10 kft above the ground over Catalina. 4:12 PM. Altostratus opacus praecipitatio or Nimbostratus, either name will do. Recall the quirk in our cloud naming system that makes, “Nimbostratus” a middle-level cloud. The base of these clouds is the general level where the snow falling out has evaporated. Due to bulging tops, and stronger updrafts, a little of the precip was able to fall out because the snowflakes coming out the bottom had grown larger and were able to survive the dry air below cloud base. Some rain fell about this time in Catalina. Not enough to darken the pavement completely at any time. The main thing to take away from that hour of very light rain is that it was not “drizzle” as even some errant meteorologists call such sprinkles. You will be permanently banned from attending any future meetings of the cloud maven club if you refer to such rain as we had yesterday afternoon as “drizzle.” Drizzle is fine (200-500 micron in diameter drops that are very close together and practically float in the air. Because they fall so slowly, and are so small to begin with, you can’t have drizzle at the ground from clouds that are much more than a 1000 feet or so above the ground because as soon as they pop out the bottom, those drops start evaporating and fall slower and slower by the second, and in no time they can be gone even in moist conditions. That’ s why its somewhat hilarious and sad at the same time, when, in particular, military sites for some unknown reason, report ersatz “drizzle: (coded as L, or L-) in our hourly aviation reports from clouds that are based at 5000 feet or something CRAZY like that. 5:47 PM. Rainbow lands on the University of Arizona Wildcat’s Skycenter atop Ms. Mt. Sara Lemmon. Nothing that you don’t already know about, so no use me blabbing about it too much. But in case you haven’t seen it, The Return of Joe Low (after over-hydrating over the warm waters of the eastern Pacific), is expected over the next couple of days, with a little help from another disturbance, to bring colossal rains to eastern Arizona and especially New Mexico. Below, from our friendly U of A Wildcat Weather Department a model run from yesterday’s 5 PM global data (the Wildcat’s downsize the US WRF-GFS model in this awesome depiction). Check out the totals expected by the evening of October 23 rd. Stupendous. Usually these totals are a bit overdone, but even so…… Will take a nice bite out of drought. Precipitation totals expected by 5 PM AST October 23rd. Looks something like a tie-dyed Tee. 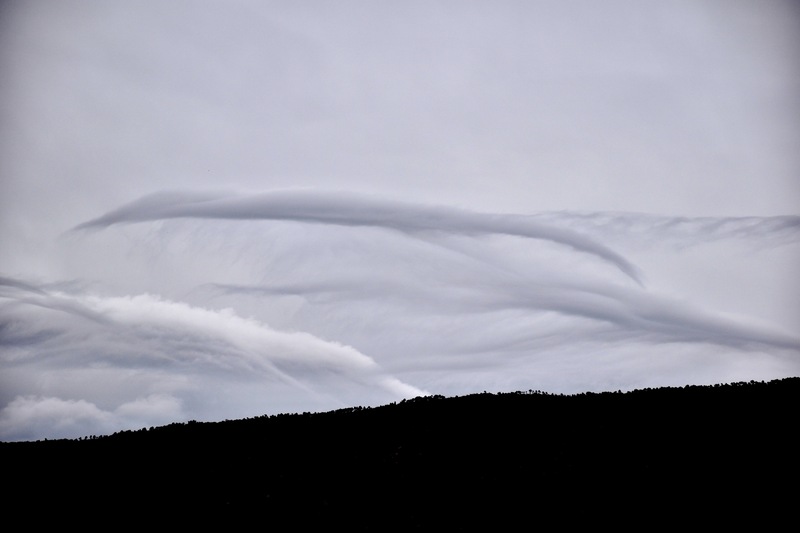 For the second time this month, cloud-centric folk had a rare and happy sight: “naked” Nimbostratus, that is, the well-known mid-level1 precipitating cloud layer was present for all to see, but without the obscuring lower cloud decks normally associated with it, clouds like Stratocumulus or Stratus. Time and time again those pesky lower layers prevent one from seeing whose really producing the rain or snow at the ground because when precip is falling, its normally moist enough that lower clouds are present. 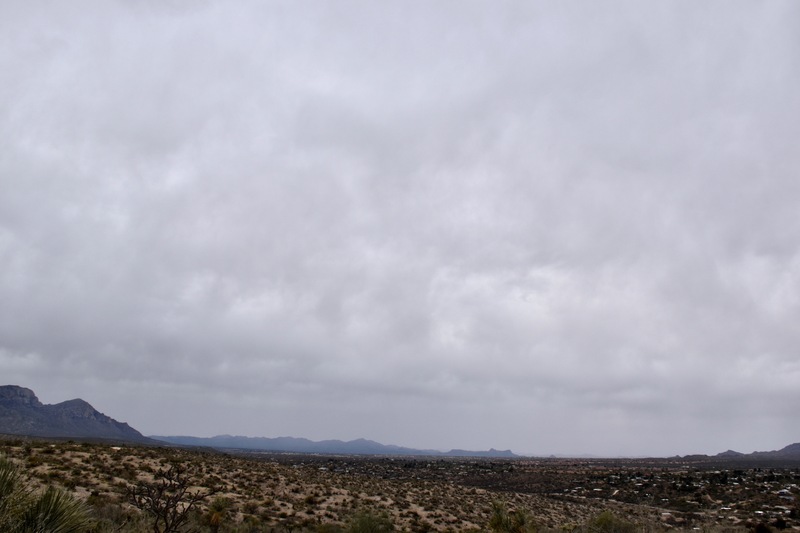 Those lower layers are important in enhancing precip because while they aren’t precipitating themselves (though it may seem like it) the drops falling into them from the Nimbostratus higher up, 1) won’t evaporate inside the cloud, and 2), if the droplets in the Stratocu are large enough, some of them will be collected by the raindrop falling through it and it becomes larger, the rain that bit heavier! How great is that? Oh, yeah, that Nimbostratus layer sans lower clouds…. 12:37 PM. 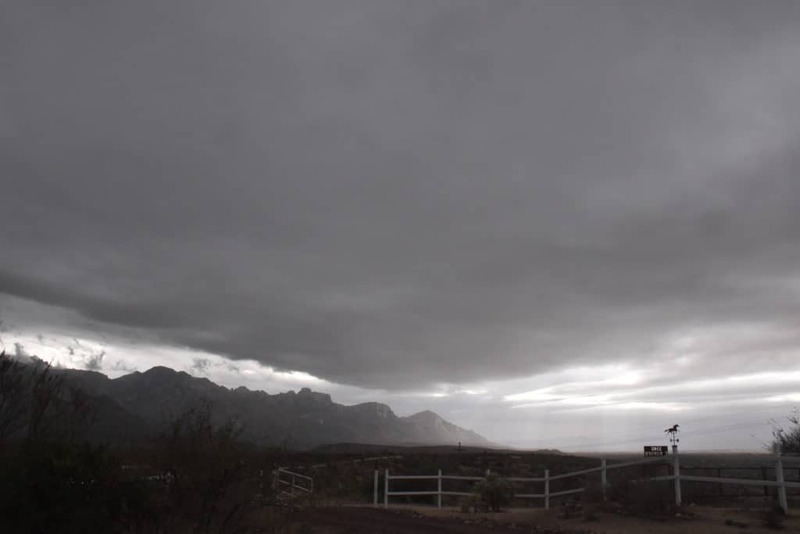 A layer of pure Nimbostratus produces very light, steady rain in Catalina. Cumulostratus3 clouds line the Catalinas below it. Except for the rarity of the view, not much to see. 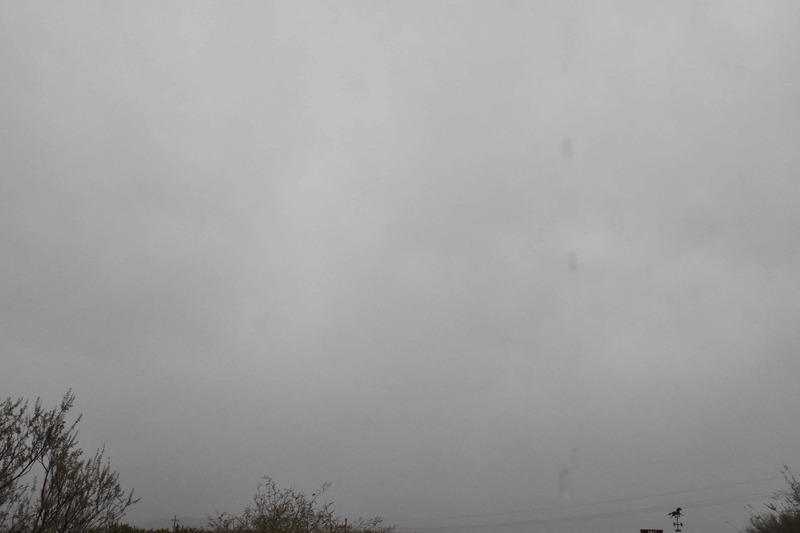 The bottom is blurred by falling precip, and when its snow, where that snow melts into rain is perceived as the base of Nimbostratus. So…….in the warmer time of the year, “naked” Nimbostratus has a higher perceived “base” than in the cooler time of the year. 12:07 PM. 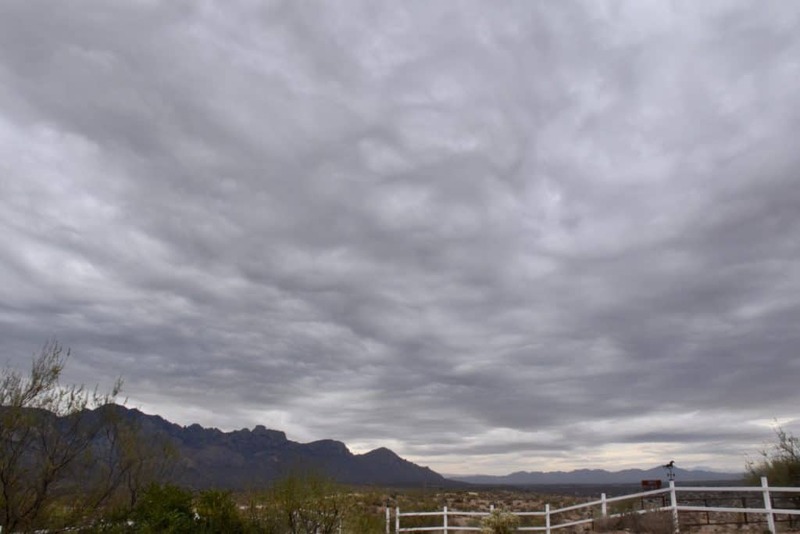 An example of the newly named cloud, “Cumulostratus.” Really there is no existing name that really hits this, maybe Stratocumulus castellanus. 2:07 PM. Kind of fun to see the hide and seek the “Cumulostratus” clouds were playing with Samaniego Ridge and Ms Mt Lemmon, too. Not much immediately ahead in weather, oh, maybe some scattered showers later Sunday through Tuesday. Nothing really great jumps out of the spaghetti plots in the longer term. The Canadian model thinks the newly formed desert lands of northern Cal all the way down to “Frisco” will get drenched, beginning in five days or so. That’s good. The USA model, using the same global obs at 5 PM AST yesterday, do not see that happening, but rather just some very light rains. Go Canada! 1Probably doesn’t seem like Nimbostratus should be grouped with mid-level clouds like Altocumulus and Altostratus, but it is, strangely believe it, as I like to say. On synoptic weather maps it was placed above the station circle, indicating a mid-level or high cloud was present, as a “lazy F”, the character “F” lying on its back. Cloud types are no longer plotted on surface weather maps since today, clouds are mostly detected by machines, not humans. “Rise of the machines.” You know the story. 2The shot here forwarded to me with much excitement by pro photographer, Rick Bowers, of Bowers Photo, who had tried to photograph this vermin for about 20 years he reported. 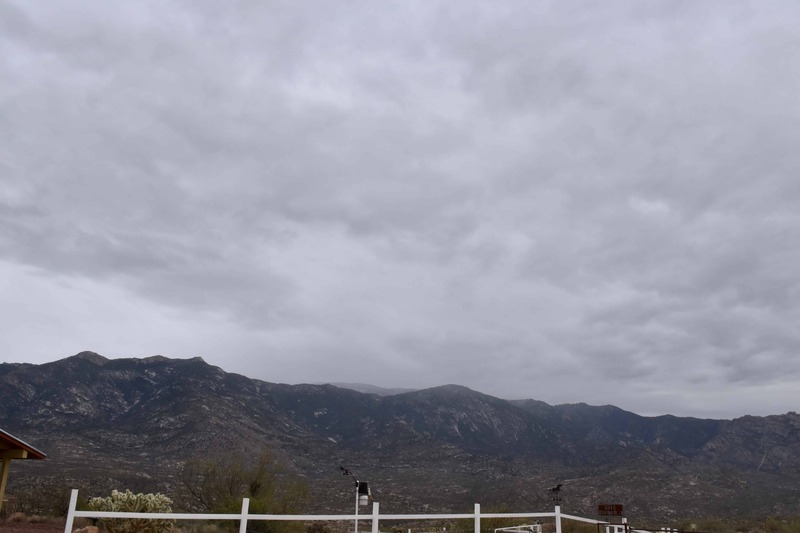 3“Cumulostratus” is a name I made up because IMO there really is no satisfactory name for the cloud that lined the Catalinas/Samaniego Ridge yesterday. 1) The quarter inch predicted/hoped for here fell on Borrego Springs, CA, (0.27 inches) instead. So, it was pretty close. We received a measly trace in the past 24 until we got 0.05 inches just now! Barely made the 0.05 inches, thought to be the least that could fall. So, in humility, will be expanding limits of storms, maybe go with 0-5 inches possible amounts for every next storm. Should hit those. 2) Mods still think more rain is ahead over the next few days, beginning on Thursday. This period of rain has always been predicted to be more than yesterday anyway. 3) As an outstanding weather note for my reader, I thought I would post this photo from a friend in Seattle of the exceptionally warm weather for this time of year they had yesterday in Seattle (60s). A young1 woman at Green Lake in Seattle displays how warm it is by dawning a bikini, near where the present writer used to live. “Smells like global warming”, as Seattle’s own Kurt Cobain1 might have said about yesterday, if he wasn’t dead. While there have been studies about cherry blossoms and that kind of thing coming out earlier in the spring back East of late, maybe there should be one about bikinis coming out earlier, too. How many weeks earlier in spring than during the Little Ice Age, do we see bikinis nowadays? How long has the bikini season been lengthened? Is it commensurate with lengthening of the growing season? That would be a VERY interesting scientific question to address, one that needs to be fully addressed via graphs and photo documentation. Applying for NSF global warming grant monies now….. Yesterday afternoon at Green Lake in Seattle. A young woman dawns a bikini! Unheard of in January in Seattle! Thought I would display this full size so that you could see how warm it is. Thanks to Bob S, Ballard District, for supplying this datum. 8:31 AM. Rainband encroaches from the south horizon. Flow was from the southeast, but movement of band was to the north. The clouds in the foreground are two layers of Altocumulus. 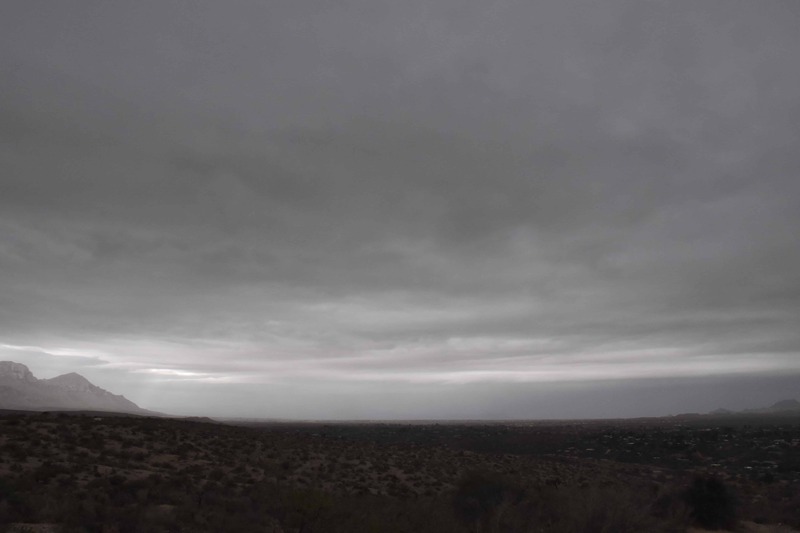 The banded rain cloud moving toward us would be Nimbostratus. 11:30 AM. Dammitall, its still not here, and now the rain coming out of the band is so slight you can see through to the other side! Nice birds of some kind on the wires, upper left. Makes me think of that Leonard Cohen song, Bird on the Wire, best interpreted by Judy Collins, of course. 11:31 AM. Lotta birds on the wire. I thought you should see this. Above, Altocumulus/Stratocumulus, with a higher layer of Altostratus. 4:08 PM. 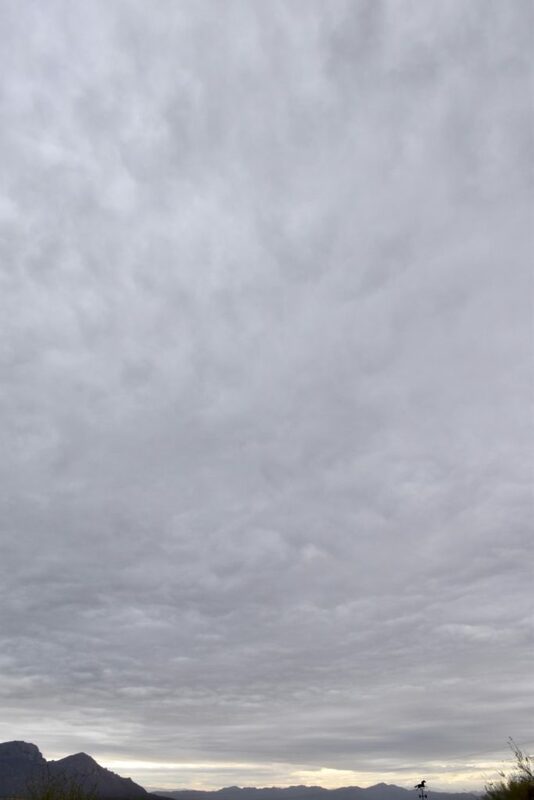 After the trace and clearing, a new bank of Altocumulus/Stratocumulus and rain band approached from the south. 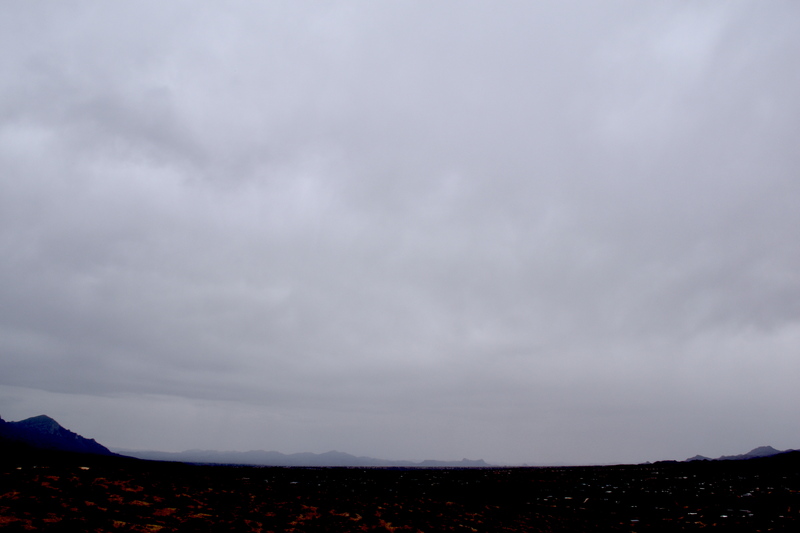 Virga can be seen on the horizon, too. Hope building again for measurable rain. 4:19 PM. 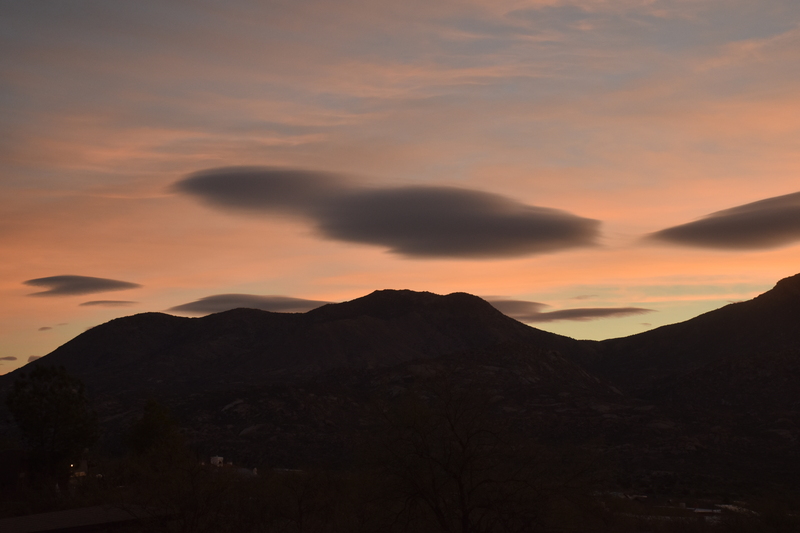 From the corral, a display of Altocumulus/Stratocumulus lenticulars downstream from the Catalinas. Nice lighting on hills, too. 4:30 PM. Cloud maven juniors should have noticed that the lower layer of clouds here (left of center), are LOWER than the clouds that passed over earlier. That means the incoming rainband had a better chance of producing measurable rain though it didn’t. 4:40 PM. 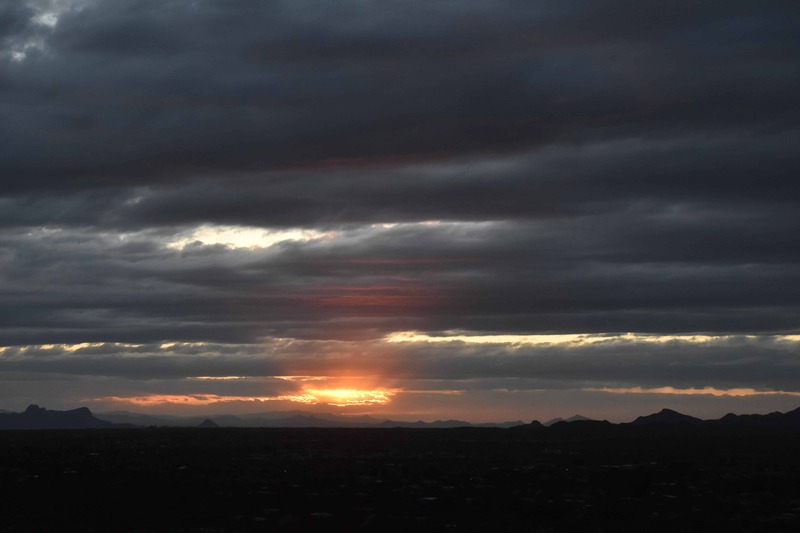 Another great sign that measurable rain was on the doorstep though it didn’t were these faint Cumulonimbus tops showing up beyond Pusch Ridge. Gettin’ excited here, as you were no doubt. Some pretty hard radar cells came up out of Mexico then. That’s it. No more photos, no rain last night, either, but in some kind of rain miracle, it has just put 0.05 inches in the gauge! So, the forecast from this typewriter that 0.05 inches was the least that could occur in this “storm” has been verified! Conditions not ripe for much more, though a few light showers are still upwind. Clouds oughta thin as the morning goes along, with huge breaks in the clouds this afternoon. Mods suggest more rain beginning as early as Thursday night. This one has more potential for rain here, somewhere between 0 and 5 inches, i. e., only a 10% chance of less than zero; less than 10% chance of more than 5 inches. There, that should do it…. Composer, lead singer for that Seattle band, Nirvana. You can see Kurt in a cloud of smoke singing, “Smells like air pressure here“, a Bill Nye parody of the true Nirvana hit where Cobain sings in a lot of smoke, “Smells like teen spirit.” Compare versions. From yesterday’s 18 Z, or 11 AM AST WRF-GFS model, this behemoth. Seems to be reaching up to grab something! Millions of square miles affected! This is the SAME giant storm you saw predicted in an earlier prog and displayed here yesterday from the prior evening’s run, just more ominous-looking here in the run some 18 h later. Will it happen? Comes and goes in the mod runs, but “spaghetti” hedges it to happen, at least some rain. Valid on January 21st, at 11 PM AST. Regions of color denote those areas where the model has calculated that precipitation has fallen during the prior 12 h.
In the meantime, we received 0.09 inches here in Catalina/Sutherland Heights last evening, another shot of rain, with more little systems like that one predicted to affect us during the coming week. If you were watching, you saw that you could see blue sky on the NW horizon while it rained steadily, most of the day to our S. Go here to get the Pima County ALERT totals, the greatest about a quarter to a third of an inch. 1:31 PM. A rain band from mid-level clouds makes it way slowly northward toward Catalina. Altocumulus opacus to the north of the raining cloud; the precipitating cloud farther south is Nimbostratus (few know that the official cloud folk label “Nimbostratus” as a middle level cloud). 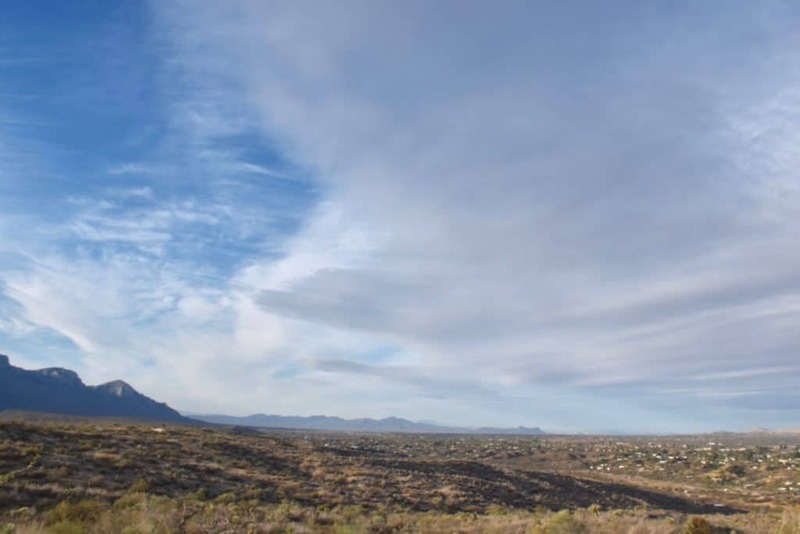 Winds blasting out of a strong high pressure center in Texas pushed into Tucson, pushing the “usual” city effluent west and northwest into portions of southern Marana and the Continental Ranch development where snowbird and iconoclast climatologist, Mark Albright lives. Today’s word game is, say “iconoclast climatologist” three times as fast as you can. 5:11 PM. 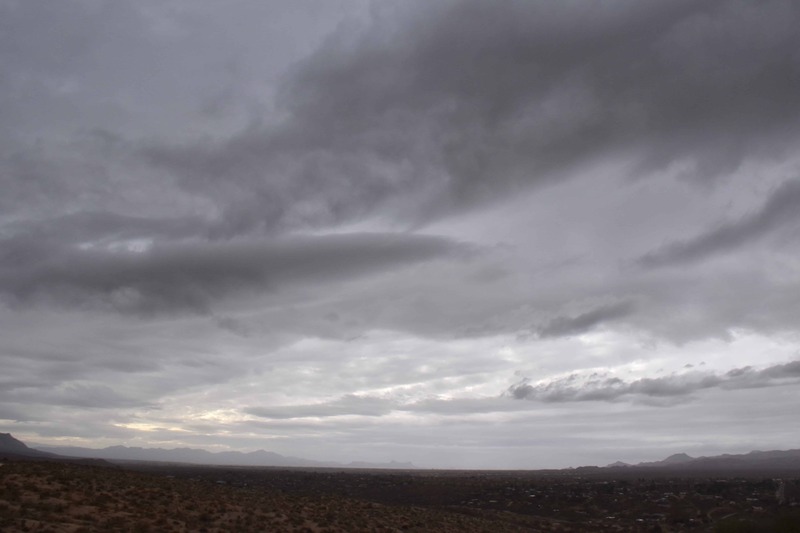 Both sides of this cloud mass were visible near sunset, the clearing to the northwest beyond the virga can be seen here on the horizon while at the same time to the SSW, you could see the clearing on the south side. Really thought the chances of measurable rain here had ended at that time, but maybe, since 0.09 inches fell later in the evening its not good to say that, make you lose confidence in the things you read here.